Group sales fell 0.8% in the third quarter. And Sainsbury's Justin King won Britain's Most Admired Leader. Seems the mighty still have further to fall, as Tesco announced this morning that like-for-like sales fell in all its markets in the third quarter. 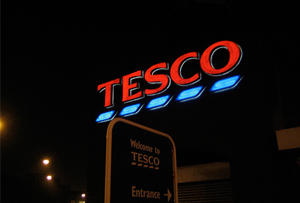 Tesco’s group sales edged up 0.6%, excluding petrol, in the 13 weeks to 23 November, helped by a rise of 0.9% in the UK. However, the supermarket leviathan needs more than a little help - UK like-for-like sales were down 1.5%, stripping out petrol and VAT, while Asia was down 5.1%. As it struggles around the world, Tesco doesn’t seem to have recovered from its humiliating decision to pull out of the US earlier this year, after its Fresh & Easy chain turned out to be rather stale and difficult. That cost the grocery giant £1.2bn, alongside the £804m write-down of its UK property portfolio announced with its full-year results back in April. ‘Continuing pressures on UK household finances have made the grocery market more challenging for everyone since the summer,’ Clarke said, attempting to make everyone forget that Sainsbury’s pre-tax profits shot up 9.1% in the six months to 28 September. Sainsbury’s, sensibly it turns out, didn’t try to break America either, probably remembering that boy bands are the only British export that can reliably crack the US nut. With Sainsbury’s flexing its muscles, Aldi and Lidl stealing away the discount market and Waitrose sitting pretty at the upmarket end, Clarke doesn’t really need any more salt in his wounds. Then Sainsbury’s chief executive Justin King was named Britain’s Most Admired Leader yesterday at MT’s Britain’s Most Admired Companies awards. Former Tesco top dog Sir Terry Leahy took the top gong no fewer than eight times in the noughties, while the retail giant won most admired company an unmatched six times between 1996 to 2006. This year, Tesco languished in 191st place in the rankings.